Cold air intake systems aren't created equal and savvy customers know it. This is why Volant Intakes are so popular with customers who know their air intakes. What makes Volant Cold Air Intakes different? First, Volant eliminates your restrictive factory airbox, filter, and intake tube. In its place goes the Volant Power Box. This box houses a high flow Volant Air Filter that is cleanable and reusable for as long as you own your vehicle. This superior design protects the filter and ensures that colder air is pulled in from the fender instead of the engine bay, resulting in more horsepower and torque. Being an enclosed system, it keeps your engine quiet at cruising speeds, but allows it to still roar to life when you stomp the gas. 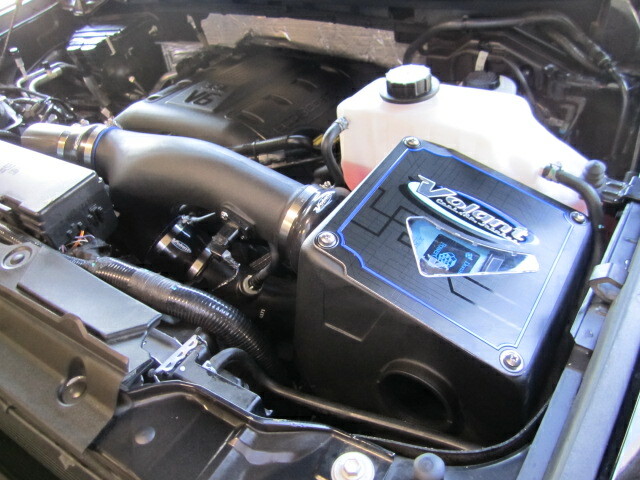 The part number for this Volant Intake is 19535 or 195356 (depending on whether you upgrade to the PowerCore Filter or not) and it fits 2011 Ford F150 3.5 EcoBoost models. This intake will NOT fit 2012 models! Your new Volant Cool Air Intake offers you two choices for the air filter: The Standard Oiled Filter and the Volant PowerCore Dry Filter. While both filters offer the exact same horsepower and torque, there are some differences in how they are maintained. The Volant Standard Oiled filter is the filter that your Volant Intake comes with regularly. It will need to be cleaned and oiled when it becomes dirty. The cleaning process is the exact same as a K&N filter if you have ever had one of those before. You will wash the filter, and apply a filter oil to the filter once it has dried. You will need a Volant Filter Cleaning Kit, which includes enough filter oil for three cleanings. We sell the Filter Cleaning Kit for $14.99, or you can buy a filter cleaning kit at your local auto parts store. You will need to clean the filter about once a year (more often if you do a lot of driving or are in very dirty/dusty conditions). The Volant PowerCore Dry Filter Is maintenance free! Available as an upgrade (for an additional charge), the Volant PowerCore Dry Filter requires no oiling like the standard filter does! The PowerCore filter will hold up to two pounds of dirt without becoming clogged and can be cleaned with a shop vac in minutes. The filter is maintenance free for 100,000 miles meaning you can install it and forget about it. This Volant Cold Air Intake is 50 State street legal. If you are in California, a SMOG technician may ask you for a CARB EO number proving this intake is California emissions approved. The CARB EO Number for this intake is: D-526-7 This EO number will be verify the California street legality of this intake, meaning no hassles at inspection time.